I have three editions of Star-Spangled Summer, one hardcover from 1941, and two Scholastic paperbacks: one from 1961 (shown above) and one from 1972, which is the one I grew up reading. This innocuous little paperback introduced me to (as the back cover of my 1941 edition reads): "Stories about teenagers . . . written specially for teenagers. The Famous Janet Lambert books for girls." 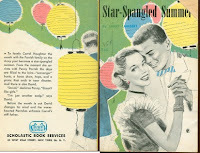 Star-Spangled Summer is the first in a sprawling series of books in which characters in two army families repeatedly intertwine--and marry. You can find a partial listing of the series here. Enough introduction! On to the story! As the novel begins, Carrol and Penny are on the train, heading to the army post where Penny's family lives for a visit. They had recently met when Penny was visiting family in the city. Carrol lives with her grandmother, and hardly sees her cold, rich father, so this visit to Penny's rowdy, big family will be quite a change. And they are rowdy, as we see when the whole family piles out of the station wagon, from Major Parrish to his wife Marjory ("attractive in a red-gold gypsy kind of way"), rambunctious children Bobby and Tippy, to handsome older brother David. Don't forget colored olderly Williams and dear cook Trudy (who is a well-drawn, complex character--despite the "lands" and the "laws"). Carrol settles into her visit, getting to know the rituals of the post, and life among a group of fun-loving kids. She goes riding with David, and they become friends despite her earlier contention that he was "terribly conceited." The group plans a scavenger hunt that takes them all over the post--including to an attractive young officer's quarters. Drama ensues when Carrol gets a large, unsolicited check and a cold letter from her father which Penny's jealous friend Louise discovers and badmouths her as a snob. But it all works out. But Penny has a plan--to reunite father and daughter. The next big event (after a horse show) is the hop, or the dance on the post. "There were no formal programmes. Someone asked you for a dance--and away you went. When the first encore began it was sink or swim, for anyone could cut. If you were popular you danced joyfully from one pair of arms to another and if you weren't, you probably went home and cried yourself to sleep." Carrol's father does come to visit the family at the post, but he's cold and difficult to know. Things change, though, after the moonlight picnic. Mean girl Louise angles with Carrol's father for an invite to New York (not knowing that Carrol lives with her grandmother, not her father) and then Louise's horse acts up, and suddenly "Carrol lay on the ground, very white and still, and blood was trickling slowly down her forehead." Despite being kicked in the head by a horse, Carrol recovers, reunites with her father who invites her to live in New York with him, and since David is on his way to West Point, they all fly off together in a private plane. On to the next adventure! "A happy, wholesome story, full of high excitement, gaiety and keen humor. The girls are delightful, the young men gallant--West Point bound. Girls, and boys too, in their early teens are certain to find this tale of modern American army life absorbingly entertaining."